For unique, quirky home decor products that have a generous dose of magic and whimsy to your space, Karigari is your Place. With vintage charm and a feminine grace, Karigari’s quirky home decor collection and home accessories are a perfect addition to any home. From Essential boxes, cushion cover, photo frames, wall decor frames and trays and a whole lot more – we cater to every delightful whimsy! We find inspiration and wonder in the details to turn a home into a pretty paradise. For shipping i would be using courier services to deliver clients door steps. I would take 7-10 working days to reach. I would only except return only if the product is damaged on shipping, or a wrong product is delivered. In case of return, refund will be done in 7-10 working days as soon as shipment reaches its warehouse. 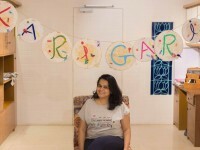 Kariagari is a brand that focus especially for home decor and essential products. We have our set up at Ahmedabad.